With the recent popularity of Black Panther and A Wrinkle in Time, America is experiencing a resurgence of Afrofuturism. Musicians like Rihanna, Beyoncé and Janelle Monáe frequently incorporate aspects of Afrofuturism into their videos and their fashion. And here at Ford’s Theatre, Dorothy and her friends go on an Afrofuturistic journey through Oz in The Wiz. At our Teacher Preview for The Wiz, we explored Afrofuturism with our teachers. Below, we share highlights. It’s hard to pinpoint the birth of the Afrofuturism artistic movement, but some scholars believe that it began to thrive in America in the 1970s. African-American musicians, like Earth, Wind & Fire, Parliament-Funkadelic and Sun Ra infused space imagery and sci-fi sounds in their music, cover art, performances and fashion. A memorable icon of Afrofuturism is Parliament-Funkadelic’s Mothership Connection, which is displayed at the Smithsonian's National Museum of African American History and Culture. In this clip of a live performance from 1975, Bootsy Collins croons, “We want the mothership!” In dramatic fashion, a spaceship lands onstage, and a flamboyantly dressed George Clinton emerges. 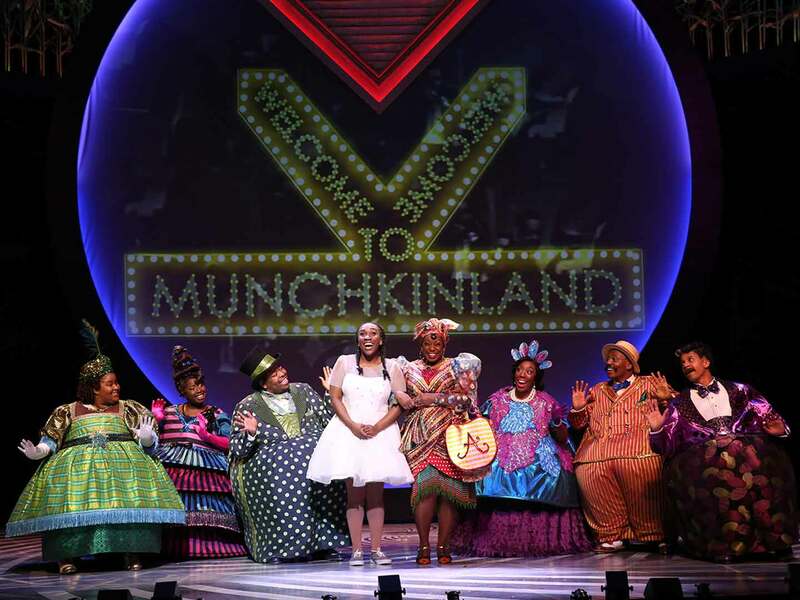 A view of Munchkin Land in the Ford's Theatre production of "The Wiz," directed by Kent Gash. Photo by Carol Rosegg. When asked what the Mothership Connection was about, George Clinton said, "We had put black people in situations nobody ever thought they would be in. I figured another place you wouldn't think black people would be was in outer space.” The mothership is portrayed as a salvation, perhaps transporting the band, and its fans, to another time and place. A great example of this is the band Earth, Wind & Fire. For their 1975 album Spirit, the cover art depicts the pyramids of Egypt, giving honor and glory to their African origins. It also depicts the black male body as strong, focused and futuristic in all-white clothing. The image implies the band has a higher, more-evolved consciousness than mortals on earth. In fiction, novelist Octavia Butler put African-American women into the sci-fi genre in her 1979 book, Kindred. In the book, a young African-American woman living in 1970s Los Angeles is transported to a pre-Civil War Maryland plantation, where she must survive as a slave. The book moves back and forth through time, and as it does, its protagonist comes to a new understanding about the strength of her enslaved ancestors and finds her own strength from their shared struggles. Even looking at costumes from the original Wiz Broadway production, you can see a close similarity between George Clinton’s outfits in The Mothership Connection tour and The Wiz’s cape. 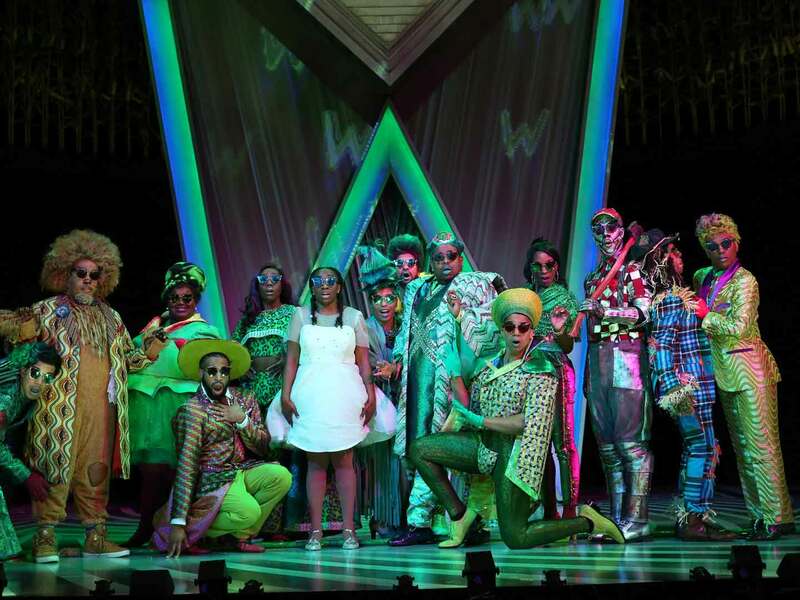 The Ford's Theatre cast of "The Wiz," pictured here in the Emerald City scene. Photo by Carol Rosegg. As Dorothy answers those questions and overcomes Oz’s many obstacles, she finds a strength she didn’t know she had. She becomes a sci-fi warrior. Interested in exploring these themes with your students? We have an Afrofuturism Lesson Plan! If you are interested in learning more, please join us for our free post-show discussions about aspects of Afrofuturism and The Wiz on April 24, May 1 and May 8, 2018. Jennie Berman Eng is the Arts Education Coordinator at Ford’s Theatre. Her favorite moment in Ford’s Theatre’s production of The Wiz involves roller skates.